Providence Academy Word | Summer (School) Fun! Do you or your student find themselves bored during the summer? As the school year ends, summer fun begins – even on campus. Providence Academy offers a wide range of summer programs; from academics, to athletics, to arts, there are camps for all ages and interests. In lower school, children can attend one week camps, or even a full summer camp through PALs camp. PALs camp is an all day summer program that lasts until early August. Students in grades 2-5 have the chance to take part in a different activity every week. For example, the Martha Burns Swim Camp, allows students to take swim lessons at the Martha Burns Swim School in Medina. In addition to the weekly activity focus, every Friday there is a special field trip! PA also offers one week programs for students who can’t commit to a full summer-long program. For example, Survivor Island is a popular week-long camp in which students in grades 3-7 work collaboratively with their teammates to design engineering projects that will help them survive on an “abandoned island” and enable them to escape. 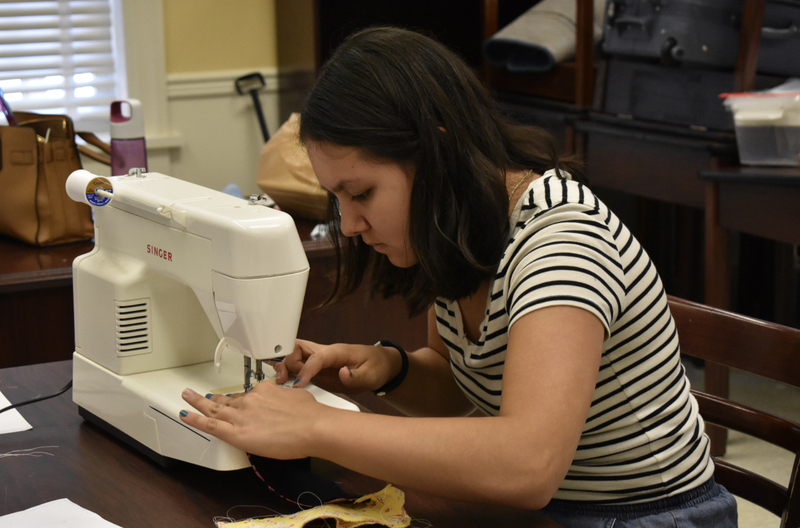 Nina von Dohlen ‘23 exercises her creative talents during an arts and crafts camp. 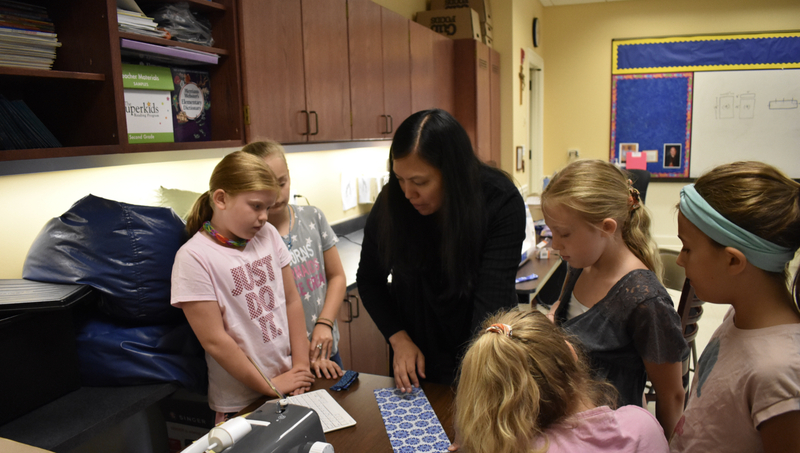 A popular middle school week-long program is Achieving in Middle School (AIM), led by Mrs. Theresa Claypool, middle school Dean of Students. AIM helps prepare students for middle school while laying a foundation for success. Claypool said, “I would encourage students to join because the camp helps alleviate any anxiety students may feel about starting 6th grade.” In addition to building friendships with classmates, she continued, “They feel better just after walking through a schedule and learning how to open their locks.” A new camp this year is the hand lettering camp, taught by Mrs. Mary Anne von Dohlen, a PA parent. During this camp, students learn how to create beautiful calligraphy simply by using Crayola markers! Mrs. von Dohlen teaches students during a previous summer camp. High schoolers also have opportunities to participate in Providence’s summer programs. The Oak Savanna Research Project, led by Dr. Boldt, is a chance to do science research during the summer. Students travel to the Cedar Creek Ecosystem Science Reserve in order to learn about the oak savanna, an ecosystem that is home to a wide variety of unique plants and animals. Students work in teams to study the aspects of the savanna ecosystem, collect data, and design research projects. 2 Responses to Summer (School) Fun! Well written, informative and SO much more interesting than I had anticipated it would be. Perhaps the title wasn’t catchy enough or I thought it would be the same old same old advertising type copy- but it wasn’t!!! Who reads the entire catalog of summer classes? I will be, because you made me say- three times in a row- I never knew that was available!? So what else am I missing? It felt like a journalist was doing research not a marketing rep truing to sell me more classes. Bravo!!!! P.s. ignore my awful grammar I have 2% battery left and want to make sure I send this before it dies and I get sidetracked! Keep up your great writing. One final comment I loved the photos you selected- they enhanced the peice.